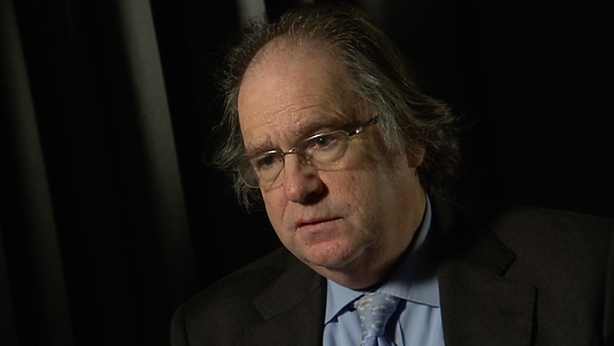 RTÉ News - Election 2016 - Poll of Polls update: And yet it moves! Poll of Polls update: And yet it moves! For a while it seemed that public opinion was a fixture in our universe, but as we enter the last week this campaign now seems to be moving public opinion, writes Michael Marsh. For a while it seemed that public opinion was a fixture in our universe, but as we enter the last week this campaign now seems to be moving public opinion. 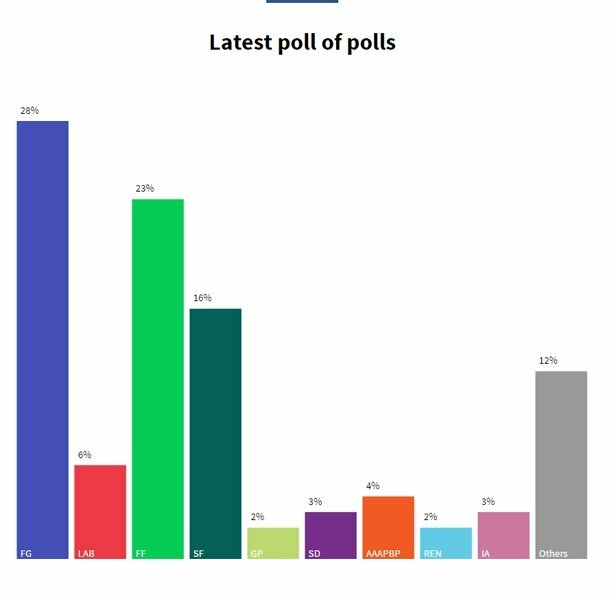 This update includes the latest Ipsos MRBI /Irish Times poll published today. Interviewing took place on 19-20 February, so it is a couple of days more recent than the several polls published on Sunday. It endorsed last week's polls in suggesting a significant shift to Fianna Fáil since the start of the campaign and the acceleration of a longer-term trend away from Sinn Féin, as well as underlining the weakness of the current coalition. 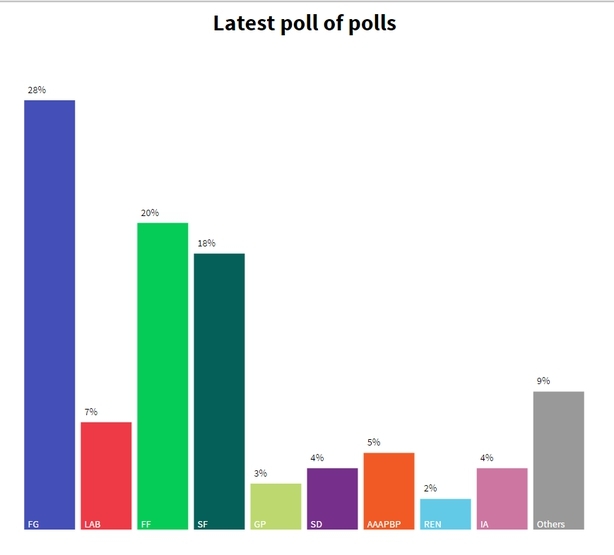 The Poll of Polls is certainly picking up these trends, although Fianna Fáil is not as high as three of the last four polls indicate, and nor is Sinn Féin as low. Because the election is now so close I also provide here a Poll of Polls based just on the 14 polls conducted in 2016. This series is of course much shorter, and the final outcome is much more dependent on the last few in the series than is the case with the more comprehensive set used up until now. However, as we have now had more polls in the last month or so than we normally get over six months, this tighter focus is reasonable. Even so, the most recent two have been from Ipsos MRBI and Millward Brown, and both normally give figures for Fianna Fáil that are around two percentage points higher than B&A and RED C estimates, though significantly they also tend to be about two percentage points higher for Sinn Féin. Seat predictions based on either approach to the Poll of Polls leave the Government well short even of 70 seats, but both would give Fine Gael and Fianna Fáil a clear majority should they agree to combine in government. 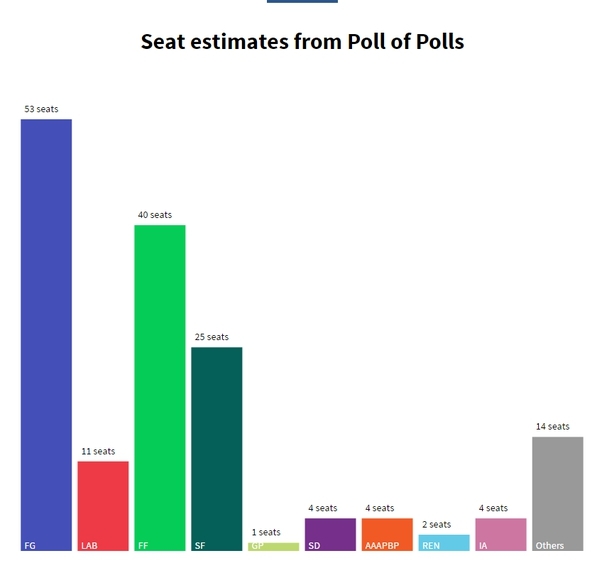 This estimation would put the outgoing government parties on 64 seats, with 53 for Fine Gael and 11 for Labour. Fianna Fáil, meanwhile, would have 40 seats, 15 more than Sinn Féin. The Social Democrats, AAA-PBP and the Independent Alliance would take four each, with two for Renua, one for the Greens, and the remaining 14 seats going to Independents and Others. Taking the longer-term polls into account, the outgoing government parties would fare slightly better, with 67 seats; 55 and 12 respectively for Fine Gael and Labour. 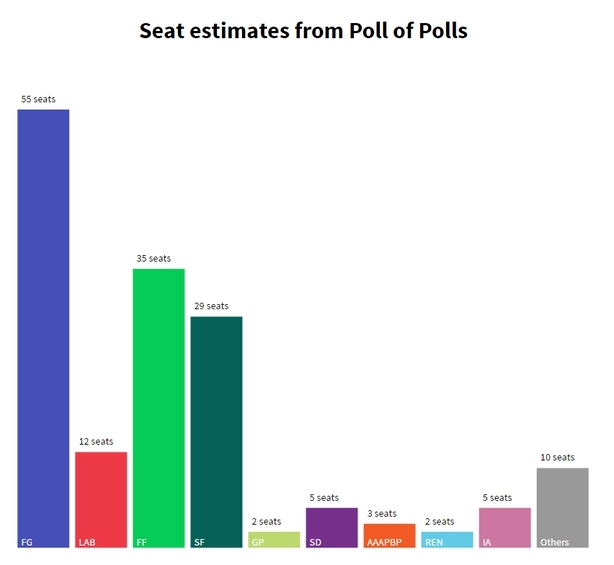 The gap between Fianna Fáil and Sinn Féin would be much smaller, with 35 and 29 seats, while the Social Democrats and the Independent Alliance would both take one seat extra, giving them five each, the Greens would take a second seat, AAA-PBP would fall to three, Renua would remain on two, and Independents and Others would take ten. 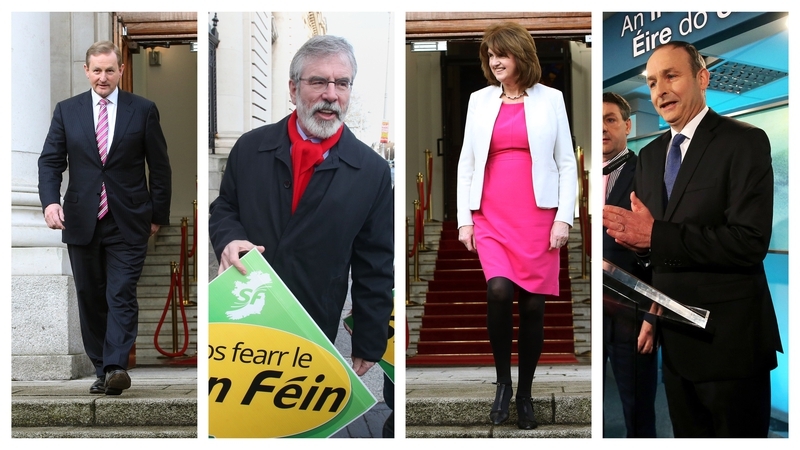 4 February: Has the rise in Fine Gael's fortunes been halted?